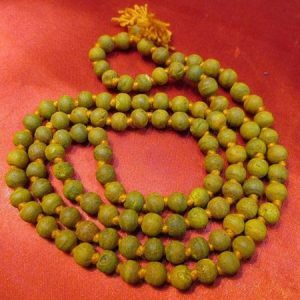 Haldi mala is used for chanting mantras of Bagala mukhi Devi. This turmeric mala is exclusively used to execute special prayer or anusthan. It is very helpful to destroy all types of negative energy, bad spirits and also keeps away the people who use this mala for chanting from their enemies. This mala is made of small pieces of turmeric knotted together in a thread having small holes in it. By using this mala for chanting human beings can bring success, prosperity, happiness, status in their life. Persons who wear haldi mala get married very soon with their desired person and all the difficulties of marriage in their life are removed by the effect of this rosary.